Autologous chondrocyte implantation is being used increasingly for the treatment of cartilage defects. In spite of this, there has been a paucity of objective, standardised assessment of the outcome and quality of repair tissue formed. We have investigated patients treated with autologous chondrocyte implantation (ACI), some in conjunction with mosaicplasty, and developed objective, semiquantitative scoring schemes to monitor the repair tissue using MRI and histology. Results indicate repair tissue to be on average 2.5 mm thick. It was of varying morphology ranging from predominantly hyaline in 22% of biopsy specimens, mixed in 48%, through to predominantly fibrocartilage, in 30%, apparently improving with increasing time postgraft. Repair tissue was well integrated with the host tissue in all aspects viewed. MRI scans provide a useful assessment of properties of the whole graft area and adjacent tissue and is a noninvasive technique for long-term follow-up. It correlated with histology (P = 0.02) in patients treated with ACI alone. There is a burgeoning interest in cartilage repair worldwide, with particular focus on tissue engineering and cell-based therapies. While much effort goes into developing novel culture conditions and support mechanisms or scaffolds, autologous chondrocyte implantation (ACI)  remains the most commonly used cell-based therapy for the treatment of cartilage defects in young humans [2–4], although no randomised trials have been completed as yet . Objective measures of the properties of the grafted regions are necessary for long-term follow-up of this procedure and to evaluate how closely the treated region resembles normal articular cartilage. Useful outcome measures that assess the overall function, structure, and composition of chondral tissue  include mechanical properties or its appearance in arthroscopy, histology, and magnetic resonance imaging (MRI), in addition to clinical assessment of the patient. However, there has been little standardisation of such outcome measures . We have therefore developed histological and MRI scoring schemes and used them to assess the quality of repair tissue at varying time points up to 34 months after the grafting procedure. In addition, immunohistochemistry has been used to assess whether the tissue in the grafted site resembled normal articular cartilage, not only in its matrix organisation but also in its chemical composition. Cartilage function reflects its biochemical composition . A small biopsy specimen such as is used for histochemical assessment can provide only limited information, as it is from a discrete location. MRI, in contrast, can provide information on the whole area. In addition, it is noninvasive and successive scans can be carried out, so allowing longitudinal monitoring at different time points. MR images have been shown to correlate with biochemical composition in other tissues, in cartilage in vivo, and even in engineered cartilage generated in a bioreactor [9–11]. Thus in this study we have used both forms of assessment of articular cartilage and correlated them where they are available at the same time points post-treatment. We have previously reported on the immunohistochemical appearance of such biopsy specimens, but only on two individuals and at 12 months after implantation . Here we report on a much more extensive sample group, obtained up to 3 years after treatment, and compare histological assessments with those obtained by MRI. *ACI carried out with cells grown in Carticel™; all others utilised OsCells, so-called because they were prepared in the laboratory in Oswestry. ACI, autologous chondrocyte implantation; M, mosaicplasty; MFC, medial femoral condyle; LFC, lateral femoral condyle; n/a not applicable; N/A not available; H, hyaline-like; F, fibrocartilage-like. T1 sagittal and coronal spin echo sequence. This provides information on the general anatomy of the joint, for example, identifying abnormalities in the menisci, cruciate ligaments, or other joint components and the subchondral bone outline and underlying marrow signal (repetition time [TR] = 722 ms; echo time [TE] = 20 ms; field of view = 20 cm; slice thickness = 3/0.3 mm; matrix 512 × 336; acquisition = 2). A three-dimensional (3D) T1-weighted image with fat saturation and a 30° flip angle. This provides information on the quality and thickness of the cartilage (TR = 50; TE = 11; flip angle = 30°; field of view = 18 cm; matrix 256 × 192; number of excitations = 1; slab = 90 mm; partitions = 60 (i.e. each slice = 1.5 mm). A 3D dual excitation in the steady state sequence with fat saturation. This demonstrates the surface characteristics of the cartilage and also highlights fluid in the joint and oedema in the subchondral bone (TR = 58.6; TE = 9; flip angle = 40°; field of view = 18 cm; matrix 256 × 192; number of excitations = 1; slab = 96 mm; partitions = 64 (i.e. each slice = 1.5 mm); acquisition = 2). The 3D images were acquired in the sagittal plane except in the patients with patella grafts, when images were acquired in the axial plane. These sequences allowed longitudinal study of the joint by comparison with previous scans carried out preoperatively, when a more extensive study also included obtaining a T2-weighted gradient echo image in the sagittal and coronal planes and axial images with spin echo sequences. For the purpose of the present study, a semiquantitative assessment has been developed, whereby each of four features considered important to the quality of the repair  are scored from the images. These can be seen in Table 2, together with the scores attributed to each feature. The scans were reviewed by one author who was unaware of the histological evaluation. Frozen sections 7 μm thick were collected onto poly-L-lysine-coated slides and stained with haematoxylin and eosin (H&E) and safranin O (0.5% in 0.1-M sodium acetate, pH4.6, for 30 s) for general histology, measurement of cartilage thickness, and assessment of metachromasia. Cartilage thickness was measured as the perpendicular distance between the articular surface and the junction with the subchondral bone, thus eliminating errors that could occur in tangential biopsies. Sections were viewed with standard and polarised light and images captured and digitised using a closed-circuit television and Image Grabber software (Neotech Ltd, Hampshire, UK). Morphology is thought to influence mechanical functioning of the tissue and is often of most interest to observers. A smooth surface is important for articulation and in the transfer of incident loads throughout the underlying cartilage. Metachromasia relates to proteoglycan content and hence load-bearing properties. Clusters of chondrocytes in osteoarthritis are a negative feature associated with degeneration. Vascularisation and mineralisation are both included as negative features, because they are not present in normal articular cartilage, but there is concern that they result from the periosteum used in the ACI procedure. Integration to adjacent host tissue is of course an important feature, and therefore 'vertical' integration to the underlying bone is included. Tissue type was categorised as predominantly (i.e. >60%) hyaline cartilage, predominantly (>60%) fibrocartilage, mixed (when there was a significant proportion of both hyaline and fibrocartilage present), or fibrous tissue. The tissue was classified as hyaline when it had the following properties: the extracellular matrix had a glassy appearance when viewed with polarised light, and the cells had a chondrocytic morphology, i.e. were oval, often with a pericellular capsule or lacuna apparent. In contrast, tissue was classified as fibrocartilage when bundles of collagen fibres were randomly organised and the cells were more elongated and often more numerous. Vascularisation and mineralisation were identified on H&E-stained sections, mineralisation being confirmed where necessary with von Kossa stain. For comparison with the OsScore, sections were scored using a modified O'Driscoll score (MOD; http://www.pathology.unibe.ch/Forschung/osteoart/osteoart.htm#project3), selecting the properties that it was possible to measure on isolated biopsy specimens. All samples were scored independently by three observers for both scoring systems. In both scoring systems, a high score indicates a good graft. Immunostaining was carried out using monoclonal antibodies against collagens type I (clone no. I-8H5; ICN), II (CIICI, Developmental Studies Hybridoma Bank, Ohio, USA), III (clone no. IE7-D7; AMS Biotechnology Ltd, Abingdon, UK), and X . A polyclonal antibody to type VI collagen was used . Monoclonal antibodies against the glycosaminoglycans chondroitin-4-sulfate (2-B-6) , chondroitin-6-sulfate (3-B-3  and 7-D-4 ), and keratan sulfate (5-D-4)  and against the hyaluronan-binding region on the aggrecan core protein (1-C-6)  were used. Before immunolabelling, sections were enzymatically digested with hyaluronidase or chondroitinase ABC to unmask the collagen and proteoglycan epitopes, respectively [23, 24], except for the unusually sulfated chondroitin-6-sulfate epitopes, 3-B-3(-) and 7-D-4, which had no pretreatment. Sections were fixed in 10% formalin before incubation with the primary antibody (before the enzyme digestion, in the case of the proteoglycan antibodies). Endogenous peroxidase was blocked with 0.3% hydrogen peroxide in methanol. Labelling was visualised with peroxidase and the chromagen diaminobenzidine as the substrate, with avidin–biotin complex (Vector Laboratories, Peterborough, UK) being used to enhance labelling of monoclonal antibodies. Nonparametric tests, the Mann–Whitney U test and Spearman rank correlations, were carried out using the Astute software package (Analyse-it Software Ltd, Leeds, UK). Intraclass correlation coefficients (ICC 2,1) were calculated to assess the reproducibility of the histology scoring systems by independent observers . ACI = autologous chondrocyte implantation; H/F, hyaline/fibrocartilage; MOD = modified O'Driscoll; MRI = magnetic resonance imaging; N/A, not available; OsScore = score devised in the laboratory in Oswestry. The thickness of the cartilage in the patient biopsy specimens ranged from approximately 0.8 mm to 6.2 mm (mean 2.5 ± 1.5 mm), whereas in the control samples it was 1.8 ± 0.5 mm (range 1.1–2.1 mm). The cartilage morphology was predominantly hyaline (>90%) in five of the biopsy specimens and predominantly fibrocartilage in seven, and the remaining eleven biopsy specimens had areas with both hyaline and fibrocartilage morphology ('mixed'). The controls, in contrast, were all of hyaline morphology except for their fibrocartilaginous meniscus. The histology scores ranged from 2.5 to 10 (OsScore) and from 6 to 22 (MOD), with the mean OsScores being 8.9, 6.6, and 5.0 for hyaline, mixed, and fibrocartilaginous morphologies, respectively (see Table 4). Mean MOD scores were 18.6, 15.8, and 13.2 for these groups. There was a correlation (r = 0.9, P <0.001) between the two scoring systems for all the 26 cartilage samples. Consistency of scoring between the three observers was higher for the OsScore (ICC = 0.77) than for the MOD score (ICC = 0.52) and the OsScore had an intraobserver error of 6% coefficient of variance. The mean thicknesses for the hyaline, mixed-morphology, and fibrocartilage cores were 2.1, 2.4, and 2.8 mm, respectively (see Table 4). The mean interval between graft and biopsy for the three groups ranged from 19.8 months to 12.0 months (see Table 4). Integration of tissue in the grafted region with adjacent tissue appeared complete as far as could be assessed. Certainly 'vertical integration' looked good, with continuous fibres usually visible from the noncalcified cartilage through the calcified cartilage to the underlying bone (Fig. 1a,1b). Lateral integration is more difficult to assess in small biopsy specimens such as those used in this study. However, in one patient treated with ACI and mosaicplasty combined, a specimen was taken obliquely. The morphology of the core suggests that it included a transplanted mosaic plug that was clearly hyaline and adjacent repair tissue that was fibrocartilaginous (Fig. 1c,1d,1e,1f,1g). The interface between these two regions, however, was fully integrated, as seen both in polarised light and on immunostaining for collagens (Fig. 1c,1d,1e,1f,1g). 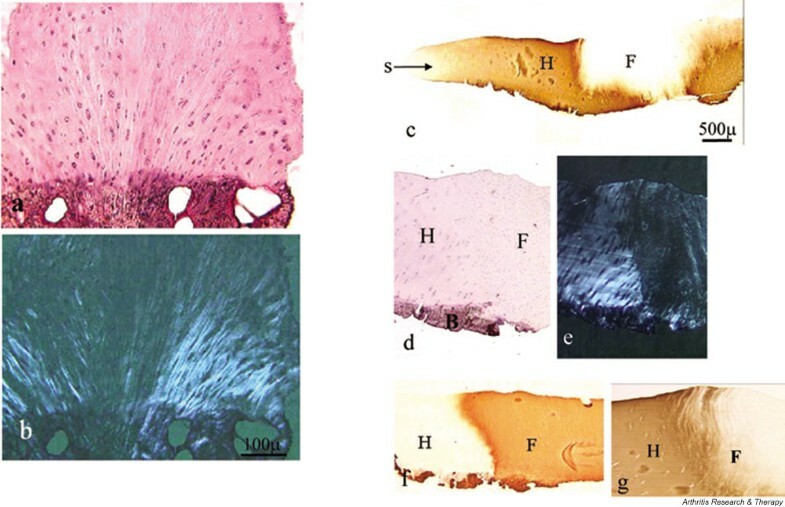 Integration between repaired cartilage and underlying bone, seen particularly clearly when a section stained with H&E (a) is viewed with polarised light (b) (sample 4). (c) An oblique section from the surface zone (S) through hyaline cartilage of the mosaic plug (H) to fibrocartilage matrix (F), immunostained for type II collagen. (d) H&E-stained higher power of the junctional zone (B, underlying bone) and (e) the same section viewed with polarised light. Full integration can be seen across this zone in sections immunostained for (f) type I and (g) type II collagen (sample 2). H&E = haematoxylin and eosin. The mean time in days between biopsy and MRI scan was 15.5 ± 12.3 days, apart from two samples for which there were intervals of 76 and 110 days. On MRI, the thickness of the graft cartilage appeared the same as that of the adjacent cartilage in 68% of patients. The surface of the articular cartilage was smooth in 26% of patients (Fig. 2) and the remaining 74% showed some unevenness, irregularity, or overgrowth at the surface. 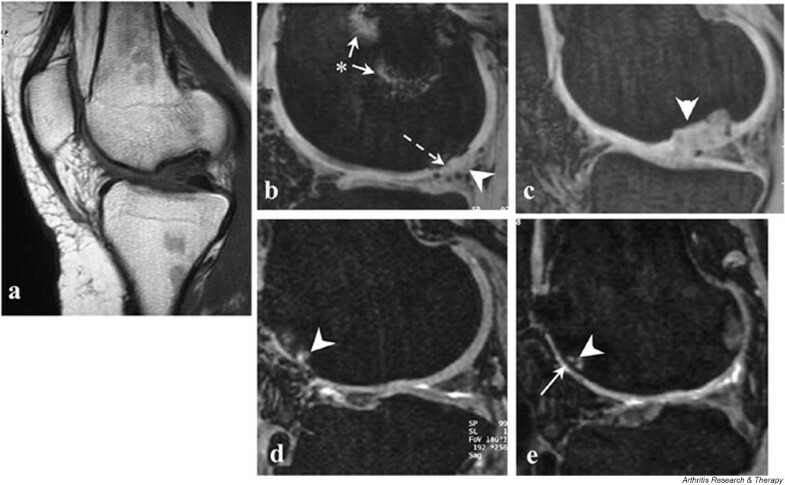 Seven patients had subchondral cysts evident on their MRI scans, two of them having been treated with mosaicplasty and ACI combined. The cyst in one patient was obvious preoperatively and so was known to be unrelated to the ACI procedure. Five of the six patients treated with ACI and mosaicplasty combined scored 0 for the bone parameter. In some patients, artefacts were visible, for example, from previous interventions, but none affected the assessment of the graft region in this study. There were instances of all MRI scores possible (up to a maximum of 4) but there was no general trend with respect to cartilage morphology group (see Table 4). When all the samples were considered together, there was no significant correlation between the MRI score and the histology scores obtained at the same (or similar) time point. However, if samples from patients with combined ACI and mosaicplasty were excluded and only those from patients treated with ACI alone were considered, there was a significant correlation (r = 0.6021, P = 0.02, n = 14) between their MRI scores and OsScores. The individuals treated with ACI and mosaicplasty combined had lower MRI scores (mean 0.9 ± 1.4) than those treated with ACI alone (mean 2.0 ± 1.1), the overall mean for all patients being 1.7 ± 1.2. Use of MRI after ACI in joints. (a) The status of the whole knee (sample 7, sagittal T1-weighted spin echo, TR = 722, TE = 20, field of view = 20 cm). (b) Cartilage surface congruity and cartilage overgrowth (arrowhead, sample 3) and (c) cartilage filling a subchondral defect (arrowhead, sample 7) can be identified on 3D T1-weighted images with fat suppression. Similarly, the images can demonstrate changes in the bone, whether uneven bone profile (b) (dotted arrow), cysts in the underlying subchondral bone (d,e) (arrowheads), or artefacts (b) (asterisk). MRI is particularly suitable for longitudinal study of grafts such as can be seen in (d) and (e), which were taken at, respectively, 6 and 30 months after ACI treatment (sample 22, 3D dual excitation in the steady state with fat suppression). 3D = three-dimensional; ACI = autologous chondrocyte implantation; MRI = magnetic resonance imaging; TE = echo time; TR = repetition time. Staining for type II collagen was positive in all specimens with hyaline morphology, although sometimes the uppermost layer (up to 300 μm) was negative. In most specimens with mixed or fibrocartilage morphology, 50% or more of the matrix was positive (Fig. 3; Table 5). There were few exceptions to this, with two fibrocartilage specimens being totally negative for type II collagen. Type I collagen immunostaining was seen in all samples but was more variable than for type II collagen. 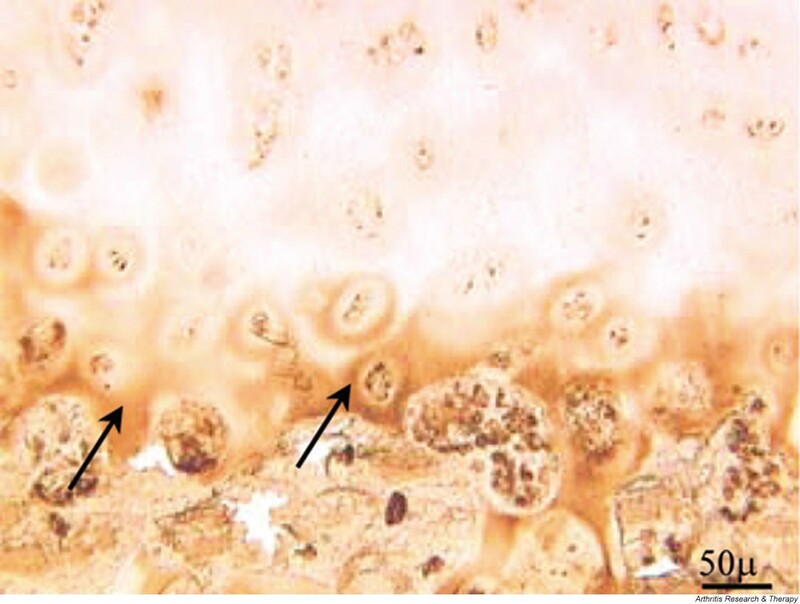 In the fibrocartilage-like samples, the staining was widespread throughout the matrix, whereas in those with hyaline morphology, its distribution was discrete and usually restricted to the very uppermost region, approximately 250 μm thick for the specimens from ACI-treated patients (Fig. 4). Staining for type X collagen occurred in 62% of samples, but when present it was only in small areas, usually in and around cells in the deep zone, close to the calcified cartilage or bone and the tidemark (Fig. 5). There was immunostaining for collagen types III and VI in all samples studied except for one, which was negative for type VI collagen. The distribution, however, differed markedly depending on the morphology of the matrix. In fibrocartilage, staining for collagen types III and VI was homogeneous throughout, whereas in hyaline cartilage it was clearly cell-associated, staining the cell and pericellular matrix but not the interterritorial matrix (Fig. 6). Immunohistochemical study of type II collagen after autologous chondrocyte implantation. Type II collagen is seen throughout most hyaline-like repair tissue (c), as identified on an adjacent section stained with H&E (a) and viewed with polarised light (b), showing zonal matrix organisation similar to that seen in normal adult articular cartilage in the surface (S), mid (M), and deep (D) zones (sample 22). In (c), note the lack of staining for type II collagen both at the surface (N) and in the bone (B). Samples with a mixed morphology (d-f) (sample 16) and some with a fibrocartilage morphology were mostly stained positively for type II collagen also, whereas a few fibrocartilagenous biopsy specimens (g) (sample 14) were negative for type II collagen (h). H&E = haematoxylin and eosin. Immunostaining for type I collagen after autologous chondrocyte implantation. Type I collagen was restricted primarily to the upper region (arrow) and bone (B) in hyaline-like cartilage (a) (sample 22) but was more widespread where the morphology was mixed (b) (sample 16) or particularly when it was fibrocartilaginous (c) (sample 14). Immunostaining for type X collagen after autologous chondrocyte implantation. Staining was typically seen around the cells in the deep zone (arrows) and calcified cartilage (sample 16). Immunostaining for type III collagen after autologous chondrocyte implantation. 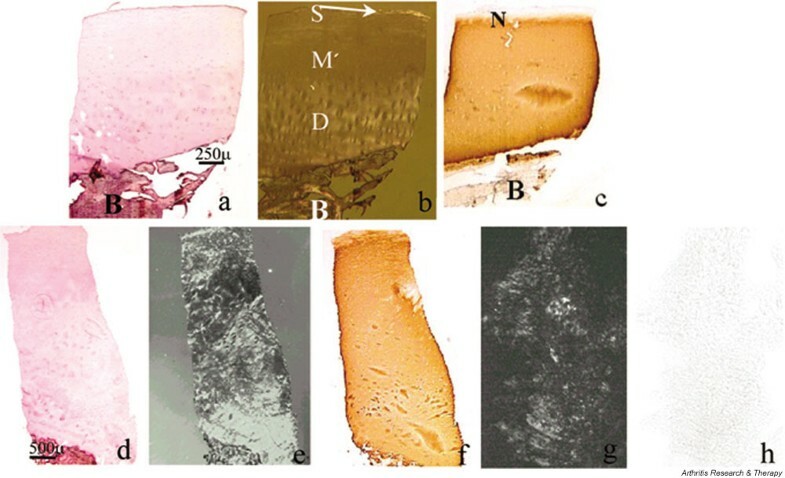 The distribution of type III collagen was predominantly pericellular in hyaline-like cartilage (a) (sample 22) and (b) (H) (sample 2), whereas in specimens with a more fibrocartilaginous morphology (b) (F) (sample 2) and (c) (sample 15), it was predominantly homogeneous throughout the extracellular matrix. - None or negligible (5% of section area); (+) slight; + some; ++strong; pc pericellular. Of the proteoglycan components, the strongest staining was for chondroitin-4-sulfate (with 2-B-6), which was throughout virtually all the matrices. Staining for the keratan sulfate epitope (with 5-D-4) was also common, particularly in hyaline cartilage. For the chondroitin-6-sulfate epitope (stained with 3-B-3), however, the distribution was often as for types III and VI collagens, predominantly homogeneous in fibrocartilage but more cell-associated in the hyaline cartilage. There was much less staining for the unusually sulfated chondroitin-6-sulfate epitopes, with 7-D-4 and, especially, 3-B-3(-), which was seen only occasionally; when present, it tended to be cell-associated in the hyaline regions (Fig. 7). Immunostaining for glycosaminoglycan epitopes after autologous chondrocyte implantation. 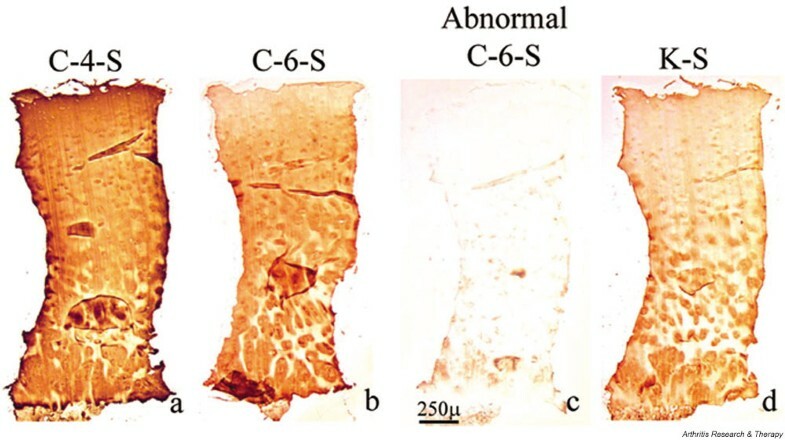 Staining was stronger for chondroitin-4-sulfate (2-B-6) (a), chondroitin-6-sulfate (3-B-3) (b), and keratan sulfate (5-D-4) (d) than for the abnormally sulfated chondroitin-6-sulfate epitopes, 3-B-3(-) (c) (sample 6). C-4-S, chondroitin-4-sulfate; C-6-S, chondroitin-6-sulfate; K-S, keratan sulfate. Hyaline 'control' cartilage was immunopositive virtually throughout for type II collagen, negative regions, if any, being restricted to a very thin strip (<50 μm) at the surface and the underlying bone (Fig. 8). The opposite was true for type I collagen, being negative apart from the bone and sometimes a very thin layer at the surface (see Fig. 8). Staining for types III and VI collagens was cell-associated and for type X collagen was restricted to the deep zone and tidemark, except in sample 24, which had slight staining in the upper surface zone. The glycosaminoglycan epitopes that stained most strongly were keratan sulfate and chondroitin-4-sulfate. Less staining was seen for chondroitin-6-sulfate, with very slight staining for the unusually sulfated epitope, demonstrated with 7-D-4. The meniscus, in contrast, had much staining for types I and III collagens, patchy staining for type II collagen, and a little for type VI collagen. Most glycosaminoglycan staining was for chondroitin-4-sulfate, with less for keratan sulfate than other samples, and no staining with antibodies 3-B-3(-) or 7-D-4 present. Typical staining and immunostaining patterns for control cartilage. Haematoxylin and eosin (a), type II collagen (b), type I collagen in the surface zone (c) and the deep zone (d) and type X collagen (e). B, bone; CC, calcified cartilage. Although ACI has been carried out as a treatment for cartilage defects for 14 years , there remains much discussion about the efficacy of the procedure, despite 74–90% of patients having good to excellent results clinically in a 2–10-year follow-up study of more than 200 patients . Objective outcome measures are required to assess any form of treatment and to date there is a substantial lack of information on the biochemical nature of cartilage repair tissue . We have used MRI and histology as a means of assessing the quality of repair tissue in patients treated with ACI, sometimes in conjunction with mosaicplasty. In an attempt to render the observations more objective and, to some extent, quantitative, we have designed scoring systems specifically for patients who have had cartilage repair. Immunohistochemistry has been used to facilitate some assessment of the biochemical components within the repair tissue. Many histological scoring systems have been published, but these have primarily been designed for animal studies of cartilage repair in rabbits [29–35] or dogs . The scores assess parameters such as cell and tissue morphology, degree of chondrocyte clustering, surface regularity, structural integrity, thickness, metachromasia, bonding to adjacent cartilage, filling of the defect, and degree of cellularity. Some of these parameters can be assessed only on whole joints, which are commonly available in the animal models but not appropriate for humans. Here, where histological examination is carried out on biopsy specimens of the repair tissue, these specimens must be as small as possible and usually obtained only at one time point (thereby having certain inherent limitations, e.g. only representing a small area at one location within the treated area). Scoring systems for human tissue have been published, but these have, in the main, been devised for studies on osteoarthritis [37, 38]. Hence many of the parameters assessed, such as growth of pannus, may be inappropriate for cartilage repair. Thus, in this study we have devised a histology score specifically for small, discrete biopsy specimens obtained from human patients undergoing treatment to induce repair of cartilage. We have identified characteristics that, in our opinion, are important to monitor and assess the quality of repair tissue. These include features such as the presence of blood vessels or mineralisation, in addition to the more obvious parameters such as integration with the underlying bone and tissue morphology. Other features should perhaps be considered for inclusion in the assessment procedure, such as the predominant type of collagen present or whether a higher degree of matrix organisation is present; i.e. whether hyaline cartilage has developed the zonal organisation typical of adult articular cartilage. While the latter is easily identifiable and could be included in the scoring scheme, the former is not necessarily routinely available in all support laboratories. Nonetheless, it was felt to be of some benefit to compare the purpose-devised scoring system to one previously devised and described in the literature. Therefore, a scoring system used by many groups researching cartilage repair was chosen: the modified O'Driscoll (MOD) score. This utilises parameters identified by O'Driscoll et al. in their study of periosteal grafts to treat cartilage defects in rabbits. The correlation between the modified O'Driscoll score (but restricted to the parameters that could be assessed on small core biopsy specimens) and the OsScore was reasonable (r = 0.91, P = 0.0001, n = 26) and they could be deemed to achieve their purpose, in that control samples of 'normal' hyaline tissue scored 94 ± 3% of maximum for OsScore and 90 ± 9% for the MOD score. However, all three observers found the OsScore much easier, quicker, and more reproducible to use. Other workers have reported that hyaline cartilage is often formed in people treated by ACI [26, 27]. In the present study, three of the five samples showing hyaline cartilage morphology were from individuals treated with ACI and mosaicplasty combined. If the biopsy specimen was taken through a transplanted mosaic plug (which makes up approximately 80% or more of the treated area), one would expect it to be hyaline cartilage. The other two specimens that were hyaline cartilage were both obtained much longer after the ACI treatment (30 and 34 months) than 16 of the 17 other cores. In addition, the average time interval between graft and biopsy was greatest for biopsies of hyaline morphology (19.8 months) and least for those of fibrocartilage morphology (12.0 months). This suggests that the cartilage that forms initially is often more fibrocartilaginous but may transform with time to remodel to form hyaline cartilage, possibly in response to loading. The appearance of zonal organisation (sample 22) typically found in normal adult articular cartilage suggests that this technique can indeed lead to regeneration of articular cartilage and may not require the use of a scaffold as is necessary in animal models . The most ubiquitous type of collagen in normal adult articular cartilage is type II , both in calcified and uncalcified tissue . The fact that this was commonly found in all but two samples of repair tissue in the present study is encouraging, even though production of type II collagen is not exclusive to hyaline cartilage and is also produced by some fibrocartilages such as the intervertebral disc . The other collagen types examined in the present study (types I, III, VI, and X) have all been described in normal articular cartilage [40, 43]. Collagen types III and VI are typically pericellular, particularly in the deep zone [43, 44] as was found in hyaline cartilage in the biopsy specimens in the present study. Type I collagen has also been reported in articular cartilage: in the normal tissue it is usually restricted to the upper surface layer and the bone, similar to that found in the control samples (see Fig. 8). Similarly, type X collagen has been found in normal articular cartilage, predominantly in the deep zone and sometimes in the surface layer . All of these collagen types – I, III, VI, and X – have been reported to occur at increased levels in diseased cartilage such as osteoarthritis [44, 46, 47]. The presence of type X collagen is considered by some people to be undesirable as it is found in the growth plate, for example, in the hypertrophic zone, which goes on to calcify. However, it is also found in extracellular matrices in cartilage  and intervertebral disc , which do not often proceed to mineralisation. Chondroitin sulfate and keratan sulfate glycosaminoglycans are typically found in both articular cartilage  and fibrocartilage , their distribution and intensity varying with age and stage of development. The presence of 7-D-4 in 'control' hyaline cartilage seen here is likely to reflect the youth of the control subjects, as other studies have shown this and other abnormally sulfated chondroitin-6-sulfate epitopes to be expressed in developing and growing articular cartilage . Lin et al. found the expression of 7-D-4 to be greatest of all the proteoglycan epitopes in repair tissue in animal models of cartilage repair. They found it was able to differentiate repair hyaline tissue from both normal and fibrous repair tissue. Certainly in the present study there was no staining with the antibody 7-D-4 in totally fibrocartilaginous samples (either the ACI biopsy specimens or the meniscus). MRI is considered by some to be the optimal modality for assessing articular cartilage [11, 53], being able to evaluate the volume of repair tissue filling the cartilage defect, the restoration of the surface contour, the integration of the repair tissue to the subchondral plate, and the status of the subchondral bone . MRI can reliably detect overgrowth or hypertrophy or graft delamination. It can also detect oedema-like signal in the marrow underlying the autologous chondrocyte repair. The significance of these marrow changes has yet to be clarified, but persistent or increasing oedema-like signal may indicate that the repair tissue is failing. The use of MRI is limited to some extent, however, by the lack of standardisation and consensus on which sequences should be used . 3D fat-suppressed echo MRI sequences provide a high contrast-to-noise ratio between cartilage and subchondral bone [54, 55], thus allowing the interface to be clearly assessed. MRI has been shown previously to correlate with cartilage histology . 3D requires a gradient echo sequence and thus there is an increase in the potential for susceptibility artefacts in the follow-up studies; consequently, there is a compromise between the greater degree of resolution obtained in such 3D sequences and the increase in obvious postoperative artefacts. This is of particular relevance in this group of patients, because so many of them have had previous surgical procedures. The grading scheme used for the MR changes in this study is at best only semiquantitative and may oversimplify and lose information that could be obtained by more sophisticated analysis. Fifty percent of patients had had between one and five procedures on their knee before undergoing ACI grafting. This will obviously influence the MRIs of that joint, often rendering their interpretation more difficult – for example, in defining the edge of the graft to assess the degree of overgrowth or incorporation. The fact that the MRI scores were lower for the patients treated with ACI and mosaicplasty combined almost certainly reflects more interference within the joint for these patients than occurred in patients treated using ACI only. Patients with mosaicplasty as part of their treatment would generally only score 75% of maximum, as they would usually score zero on the subchondral bone parameter. Several animal studies on ACI have shown that while relatively good cartilage forms initially, it often breaks down and degenerates with time. For example, in dogs , the remodelling phase at 3–6 months is followed by a degradative phase, during which the repair tissue and surrounding cartilage appear to become progressively damaged. Results from our studies suggest the opposite may be true in humans treated with ACI, in whom the repair tissue appears to 'mature' with increasing time and tend more towards hyaline cartilage than fibrocartilage . This is similar to the impression obtained from clinical results in long-term follow-up of patients, up to 10 years after ACI . Why there should be this apparent difference in progression between animals and humans is unclear. One common finding in animal studies, however, is delamination of repair tissue from the surrounding 'native' or original cartilage with time . One can imagine that if this occurs, it can only deteriorate further with movement and may be the cause of the subsequent failure of the graft tissue. Observations on patients treated with ACI in this study, and others within our centre, indicate that there is good integration between native and repair tissue. Certainly histological examination demonstrates that the cartilage integrates fully with the underlying bone. Lateral integration is not assessed routinely by the histological samples, because they are taken from the centre of the graft region. However, in the single case where a sample was taken obliquely in a patient treated with ACI and mosaicplasty combined, this showed complete integration across all regions of the sample (see Fig. 1). Lateral integration appears to be good generally, at least in the surface layers, when ascertained by its appearance and resistance to probing at arthroscopy (JB Richardson, unpublished observation). Why integration might be more successful in humans than other species is unclear. Several factors may contribute, such as the way certain aspects of the procedure are performed – for example, where and how the periosteum is obtained or fixed in place. Alternatively, the type or amount of loading and mobilisation post-treatment may prove to be influential. For example, limited mobilisation, which may be easier to control in patients than in animal models, may be important immediately postoperation in allowing protection of the surgical site in the early weeks. In addition, cells can be mechanically induced to transfer from fibroblastic to chondrocytic cells, at least in tendon , and synthesis of proteins and proteoglycans by cartilage cells is inhibited by static compression but not by intermittent loading . Other, more basic, differences between animal species and mankind may be important, such as variations in cartilage thickness, cellularity, or mechanical properties . In summary, we have used histology and MR imaging in an attempt to assess objectively the quality and hence success of ACI in eliciting repair of articular cartilage. Despite more than 6000 ACI procedures being carried out worldwide, the understanding of the biology of cartilage repair remains poor. Further long-term study of patients treated with ACI, together with the use of objective outcome measures, should improve this understanding, and is vital in allowing comparison of the long-term success of this technique with others such as debridement and subchondral drilling for the treatment of cartilage defects. It is only after true objective and scientific study  or after the completion of randomised trials  that informed judgements on the effectiveness of ACI can be made. In addition, establishing objective, standarised outcome measures will be important to compare and assess future generations of treatment regimes incorporating scaffolds and support matrices, or other, more advanced, tissue-engineered therapies. Treatment of cartilage defects can result in repair tissue of varying morphology, ranging from predominantly hyaline (22% of biopsy specimens), through mixed (48%), to predominantly fibrocartilage (30% of specimens). Repair tissue averaged 2.5 mm in thickness and appeared to improve with increasing time postgraft. It was well integrated with the host tissue in all aspects viewed. In patients treated with ACI alone, there was a correlation between the histology and MRI scores (P = 0.02). We suggest that MRI provides a useful assessment of properties of the whole graft area and adjacent tissue and is a noninvasive technique for long-term follow-up. We are grateful to Drs S Ayad, Manchester, and A Kwan, Cardiff, for the provision of antibodies to collagen types VI and X, respectively; to Professor B Caterson, Cardiff, for all the proteoglycan antibodies; to Mrs Janet Gardiner, Department of Diagnostic Imaging, Robert Jones and Agnes Hunt Orthopaedic Hospital NHS Trust, Oswestry; to Dr J Herman Kuiper for statistical advice; and to other members of OsCell (B and IK Ashton, A Bailey, N Goodstone, D Rees, S Roberts, S Roberts, R Spencer Jones, J Taylor, S Turner, L van Niekerk). The Arthritis Research Campaign has generously provided financial support.